The Nestle Peptamen Bariatric Formula Nutrition Liquid UltraPak 1000ml, Model #4390097267, is anchored in advanced science and research. Nestle Healthcare Nutrition offers nutritional solutions for people with specific dietary needs related to illness, disease states or the special challenges of different life stages. The Nestle Peptamen Bariatric Formula Nutrition Liquid UltraPak 1000 ml is an advanced formula for those with impaired GI function. 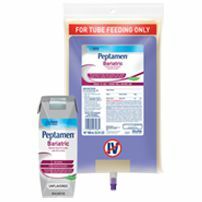 Petaman Bariatric formula has a unique protein to calorie ratio that is specifically designed to help meet the protein requirements of the critically ill patient with obesity recommended in the critical care guidelines.